Get a better rate on your student loans in less than 15 minutes with a community lender on LendKey! Finding the right loan can be time consuming, and confusing. That's why we've simplified the process using a single platform that allows you to find, customize, and fund your loan through our network of banks and credit unions. When you refinance student loans through us, our lenders won't charge you any origination fees. Our fast and easy student loan calculator lets you plug in your remaining debt and monthly payment to figure out if refinancing can improve your finances. Depending on how long you’ve been out of school, your annual income and credit history is likely to have improved. 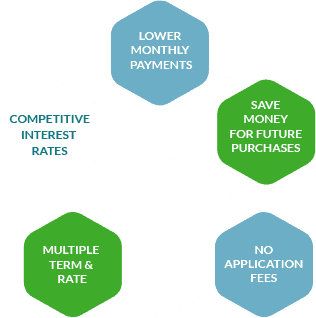 By refinancing your existing student loans you may see a dramatic reduction in your interest rate – even a few points. With only a few exceptions, it is generally advisable for all student debt holders to at least explore a refinancing scenario, especially since getting your rate through LendKey’s platform will have no impact on your credit score. With LendKey’s student loan consolidation and refinancing, you can combine your federal and private student loans into one convenient payment with a lower interest rate. That could help you better manage your finances, and save over the life of your loan.